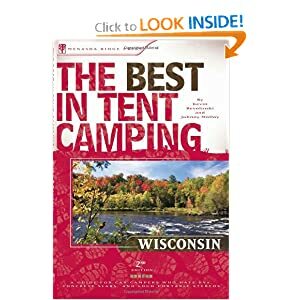 Compiled and organized by outdoor writer Johnny Molloy and Kevin Revolinski, The Best In Tent Camping: Wisconsin is a straightforward, Wisconsin oriented, information travel guide designed especially for campers who prefer quiet and serenity in their outdoor surroundings. Ratings for beauty, low noise, privacy, security, space, and cleanliness characterize each presented Wisconsin site, along with key contact information, and detailed instructions for getting there. The Best In Tent Camping: Wisconsin is an excellent and very highly recommended resource for tent campers looking to take in the natural splendor of Wisconsin. It takes a lot of effort to reach Rock Island, but the effort is worth it. From Sturgeon Bay, head north on Highway 42 for 46 miles to its end. Here, you must take a pay ferry to reach Washington Island. From Washington Island, drive north on Lobdells Point Road for 1.7 miles to Main Road. Turn left on Main Road and follow it 2.6 miles to Jackson Harbor Road. Turn right on Jackson Harbor Road and follow it 3.6 miles to the Rock Island Ferry. Campers must park in the state park lot, just north of the passenger-only pay ferry. Some claim that the best of the best in tent camping is on Rock Island, Wisconsin’s “furthest northeast point.” Located two ferry rides northeast of the tip of the Door Peninsula, a tent camping trip to this island park may leave you in agreement. Once the home of a wealthy inventor, Chester H. Thordarson, Rock Island comprises 900 acres of history and nature where beaches, bluffs and woodlands contrast with the relics of voyageurs, settlers and parts of Thordarson’s estate. The campground here lives up to its heady surroundings. Campers here live on “ferry time.” Read: all who come and go here are subject to the mercy of the ferry boat access. There are no stores on the island. You must bring all your gear and food. The campsites are all walk-in and you have to tote you gear anywhere from 200 yards to a half-mile. I recommend staying at least two nights for all the effort it takes to reach Rock Island. Get off the second ferry and head beyond leftover buildings of the Thordarson Estate, and pass the water spigot for the campground. Walk between impressive rock walls. Ahead three trails lead to various parts of the campground. “Michigan Avenue” leads toward sites #1-#12. Pass pit toilets and a changing station at the end of Michigan Avenue. A big dune separates you from the Lake Michigan on the southwest shore of Rock Island. Campsites #1-#3 are in cedar, sugar maple and oak woods just inland from a sandy shoreline. Campsites #4-#7 are a bit back from water near an old cemetery. All these sites are near an old Potawatomi Indian village and a building site of the voyageur LaSalle. Campsites #9, #11 and #13 are just on the back side of the dune in a mix of sun and shade. A grassy trail leads into thick cedar woods atop a bluff. Campsites #15-#19 are on the edge of the bluff offering a stunning view of Lake Michigan. Campsites #20 and #22 are a bit back from the water. Campsite #21 is offers lake views. Next comes a line of campsites, #23-#29, directly beside the water toward Washington Island. This line offers great sites in a mix of sun and shade on the edge of a rock beach. The third trail leads inland toward heavily wooded, well-separated sites, #30-#35 offering maximum solitude. These sites are large and fine but are the last ones taken, but would be best when the weather is cool and windy. By the way, a stone shelter building with a fireplace inside is near the campground for bad weather days. Six vault toilets are spread throughout the campground. All campsites can be reserved from Memorial Day to Labor Day. Rock Island will fill on Memorial Day weekend, then on the last two weekends of July and most days in August. Chilly winds blowing off Lake Michigan keep campers away early in the season. Consider coming in September. Just try to come because this is a shining jewel of Wisconsin. The sand and rock beaches are a big draw. No wonder — they offer picture postcard scenery. The trail system explores some of the human and natural history of the island. Everyone likes to take the mile walk to the Potawatomi Lighthouse. Built in 1836, it is the oldest lighthouse in Wisconsin. The 5.2-mile Thordarson Loop Trail continues beyond the lighthouse around the perimeter of the island to the old fishing village, where the water tower and settler house foundations can still be seen. This was the first settlement in Door County. The Algonquin Nature Loop Trail details the flora and lake history of the island. Check out the rock carvings on the bluffs just below the campground. The Viking Hall stands over a beautiful stone boathouse, part of the Thordarson Estate. In here, you can check out artifacts from the days of the Potawatomi tribe to a more recent past, including old photos and some of Thordarson’s original Icelandic carved oak furniture. Some campers shore fish for smallmouth bass and perch, but what campers like most about Rock Island is living on ferry time. You come and go with the ferries, so just relax and leave your cares behind on the mainland. Just remember to bring your tent – and everything else you will need for camping on this island getaway.